If there is one thing I love, its soup! This Parsnip and Carrot Chicken soup is the perfect alternative to Chicken Noodle and is so flavorful since all the vegetables are in season! Before I started culinary school, I attended UCSB. My roommate, that is one of my closest friends till this day, was not feeling good so I decided to make her some soup. The only soup I knew how to make was my mom’s chicken noodle. It was about 5 in the afternoon and we had no chicken in the fridge, but we did have Knorr Chicken Bouillon Cubes. So I boiled some water, threw in the cubes, some carrots and potatoes and A LOT of frozen peas. Now, my roommate despises peas! (This I did not know) When she came home, I gave her a bowl of soup, which was mostly all the peas, and she just stared at it with a blah face and said “Aww, thank you for the soup but I don’t like peas.” Regardless, she drank the broth and avoided the peas at all costs! We still laugh at the story till this day. Years later and never putting peas into my soups, I realized that chicken noodle was not the only soup that existed and that soups are one of the easiest go to meals to make! Packed with flavor and lots of nutrition, you don’t just need to eat it when you are sick! 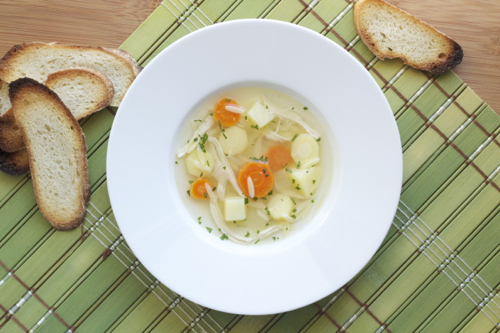 Serve this soup with some garlic toast or a grilled cheese sandwich (make it more fancy and call it a Panini). Either way, you can’t go wrong, everyone will be asking for seconds! 1. Heat 2 tbsp of olive oil in a large pot. Add the diced onions and sauté for 5 minutes. Toss in the garlic and sauté an additional 1 more minute. 2. Add the broth, water, chicken breasts, bay leaves, thyme, salt, carrots, parsnips, and potatoes. 3. Bring to a boil, then simmer for 10 minutes. 4. Remove the chicken breasts , allow to cool and add the orzo into the soup. Cook for 7 more minutes. 5. While the orzo is cooking, shred the chicken breast and add them back into the soup. Simmer for an additional 3 minutes. 6. Remove the bay leaves and thyme bunch and stir in the chopped parsley and lemon juice.